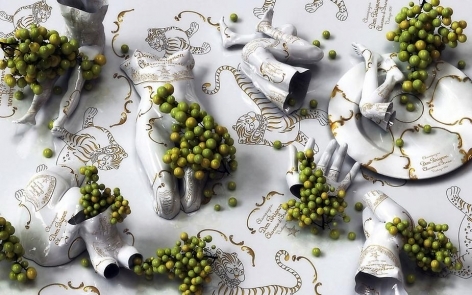 Korean artist Kim Joon introduces new digital prints exploring the universal human themes of fragility, seduction and imperfection. 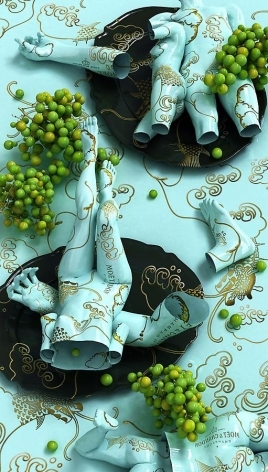 For his two latest series, Fragile and Drunken, he composes appealing landscapes of porcelain-like human bodies tattooed from head to toe in the brand imagery of upscale porcelain or liquor companies. 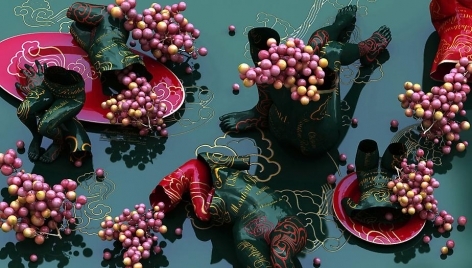 He creates these images using three-dimensional computer graphics. 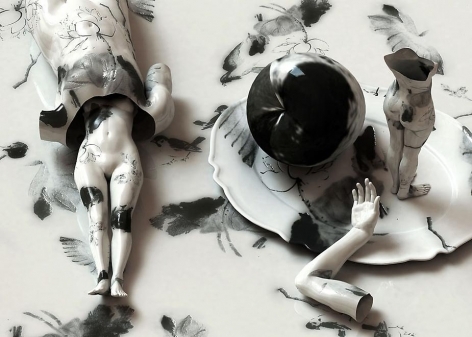 With the Fragile series, which Kim created just prior to Drunken, he turned his attention to porcelain-like human figures, instead of the more naturalistic tattooed figures he had become known for. 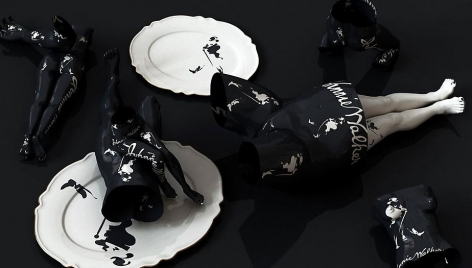 His porcelain figures are hollow, lacking limbs, and distorted. 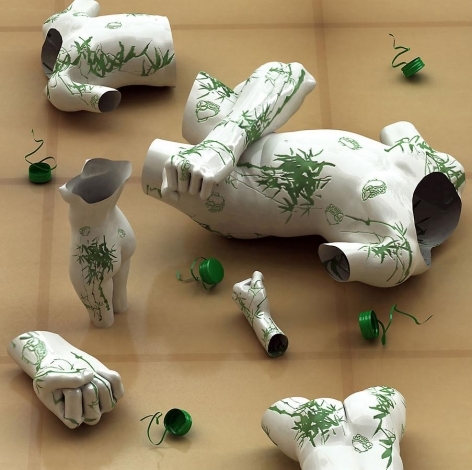 Imperfection is a recurring theme in Kim’s work, which started with his fascination for tattoos and his discovery that tattooed men were deemed unfit for military service in Korea. The artist’s exploration of tattoos stems from his experiences tattooing his peers while in the Korean military. According to Kim, tattoos are not only physical inscriptions on the body but also signifiers of mental impressions left on the consciousness. Alluding to society’s weakness for material objects, Kim’s tattoo imagery reflects our obsessions and deep-seated attachments. 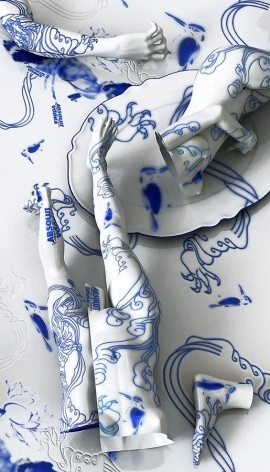 Kim Joon was born in 1966 in Seoul, Korea, where he currently lives and works. 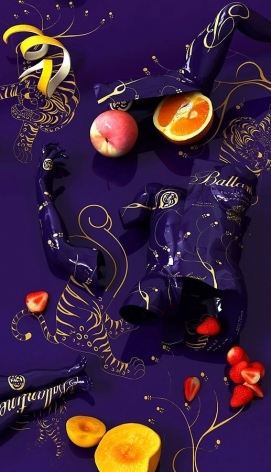 He has exhibited his work at the Total Museum, Seoul, Korea; The National Museum of Contemporary Art, Kwachon, Korea; the Gwangju Biennale, Korea; the National Taiwan Museum; Canvas International Art gallery, Amsterdam; Alexander Ochs Galleries, Berlin; Gallery Hyundai, Paris; Sabina Lee gallery, Los Angeles; Walsh Gallery, Chicago; the Saatchi Gallery, London; and Sundaram Tagore Gallery, Hong Kong, New York, and Beverly Hills.